Beautiful artwork is created with value—the degree of light and dark in a specific subject. Working in pencil, develop values and master seamless gradations from the lightest lights to the darkest darks without the usual graphite sheen. A simple exercise trains each student to draw incredible detail using practical rendering of textures and different colors of objects represented as shades of gray; to recognize luminosities, reflections and contrasts; and to execute useful and fast forms to render hairs and thorns. Each participant will design a composition and begin an original work using tricks to draw viewers’ eyes to the focal point. See below for additional details, materials list and link to the online workbook. This is an advanced botanical illustration course. *This class offers 21 hours elective credit toward the Garden Education Series: Botanical Illustration Certificate. Click here to view and print (PDF) materials list. Click here to link to the (PDF) online workbook and the YouTube guidebook supplement. Rogério Lupo is one of the finest contemporary scientific illustrators in the world, with many top awards from prestigious institutions. He works in a variety of media. He has developed online instructional manuals for graphite and pen and ink, available for download. 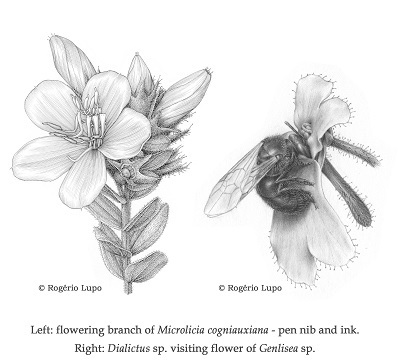 He was awarded the first prize in the Margaret Mee National Contest (Brazil) in 2002 and 2003, black-and-white category, and the first prize in the 2010 and 2013 Margaret Flockton Award for Excellence in Scientific Botanical Illustration (Australia).